Description of a nearly complete juvenile skull of Diplodocus (Sauropoda: Diplodocoidea) from the Late Jurassic of North America. J.A. Whitlock, et al. JVP 30: 442–457. The skull of a juvenile sauropod dinosaur, rediscovered in the collections of Pittsburgh's Carnegie Museum of Natural History, illustrates that some sauropod species went through drastic changes in skull shape during normal growth. "Diplodocus had an unusual skull," said Jeff Wilson, "Adults had long, square snouts, unlike the rounded or pointed snouts of other sauropods. Up until now, we assumed juveniles did too." 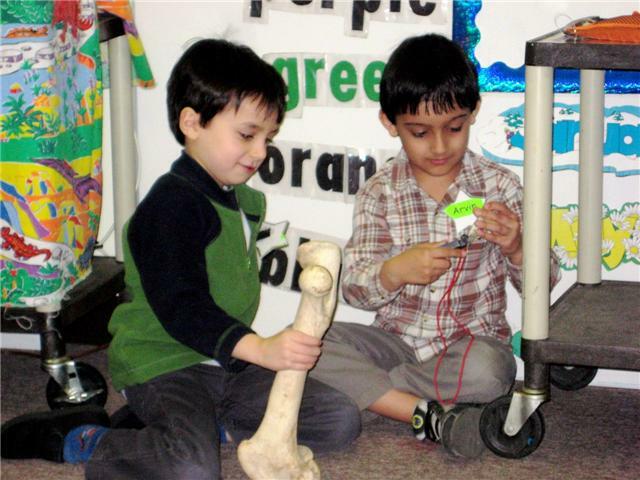 The small Diplodocus skull, however, has a pointed, rather than square, snout like the adults. This gives us a whole new perspective on what these animals may have looked like at different points in their lives." The researchers believe these changes in skull shape may have been tied to feeding behavior, with adults and juveniles eating different foods to avoid competition. 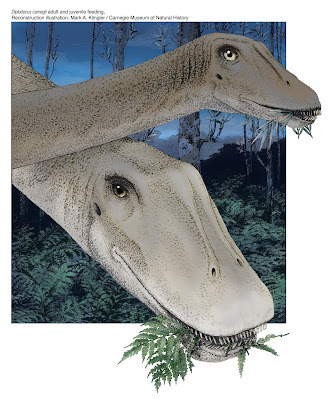 Young Diplodocus, with their narrower snouts, may also have been choosier browsers, selecting high quality plant parts. 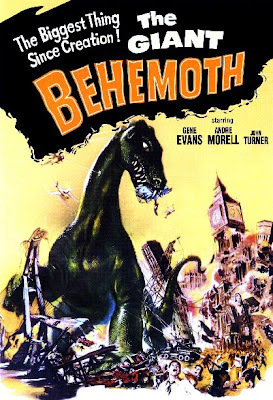 Gorgo premiered on this day in 1961. 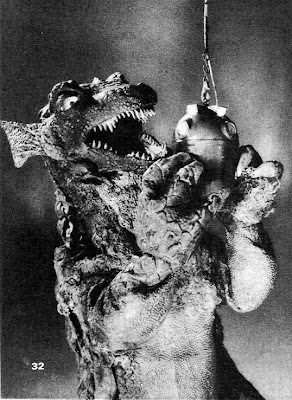 Directed by Eugène Lourié from a script by John Loring and Daniel Hyat, it featured a man in a rubber suit ala Toho’s Godzilla. 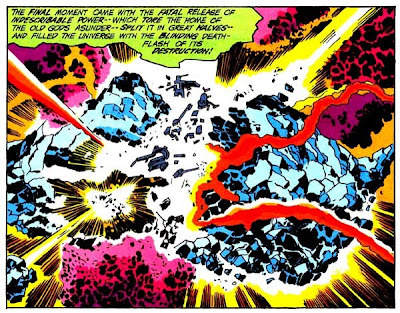 Over at Atomic Surgery the good doctors present a double bill to commemorate the day: a story by Steve Ditko from Gorgo #15 and a Gorgo filmbook from Famous Monsters of Filmland #50. A Deinosuchus lunges at an Albertosaurus in an artist's conception. Rock-hard feces and oddly bitten bones are helping to flesh out one of the biggest crocs of prehistory, researchers say. "We're pretty sure it was the apex predator in this region," said Samantha Harrell, an undergraduate at Columbus State University in Georgia, who presented her research March 17 at a Geological Society of America meeting in Baltimore. Read the story at National Geographic News. A 30 cm long pubis (above) found at Dinosaur Cove in Victoria, Australia has been identified as belonging to an ancestor of Tyrannosaurus rex. The find sheds new light on the evolutionary history of this group of dinosaurs. It also raises the crucial question of why it was only in the north that tyrannosaurs evolved into the giant predators like T. rex. "Although we only have one bone, it shows that 110 million years ago small tyrannosaurs like ours might have been found worldwide. This find has major significance for our knowledge of how this group of dinosaurs evolved." says Dr Benson. The bone would have come from an animal about 3m long and weighing around 80 kg, similar to a human, and would have had the large head and small arms that make tyrannosaurs so distinctive. Compared with T. rex, which lived about 70 million years ago at the end of Cretaceous period, NMV P186069 lived earlier during the Cretaceous, around 110 million years ago. Denning (March 27, 1914 – Oct. 11, 1998) had a long career in Hollywood before moving into TV (notably Hawaii Five-O) in the 1960’s. He had starring roles in a number of Sci-Fi flicks including Unknown Island (1948), Day the World Ended (1955), Creature with the Atom Brain (1955) and Black Scorpion (1957), but he takes a bow here for playing the greedy Dr. Mark Williams in 1954’s, Creature from the Black Lagoon. The complete mitochondrial DNA genome of an unknown hominin from southern Siberia. 2010. J. Krause, et al. Nature, published online 24 March. Abstract: With the exception of Neanderthals, from which DNA sequences of numerous individuals have now been determined, the number and genetic relationships of other hominin lineages are largely unknown. Here we report a complete mitochondrial (mt) DNA sequence retrieved from a bone excavated in 2008 in Denisova Cave in the Altai Mountains in southern Siberia. It represents a hitherto unknown type of hominin mtDNA that shares a common ancestor with anatomically modern human and Neanderthal mtDNAs about 1.0 million years ago. This indicates that it derives from a hominin migration out of Africa distinct from that of the ancestors of Neanderthals and of modern humans. The stratigraphy of the cave where the bone was found suggests that the Denisova hominin lived close in time and space with Neanderthals as well as with modern humans. 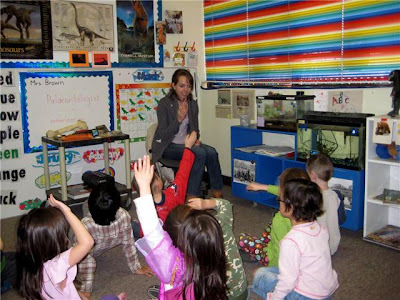 ... to a kindergarden class in Calgary. 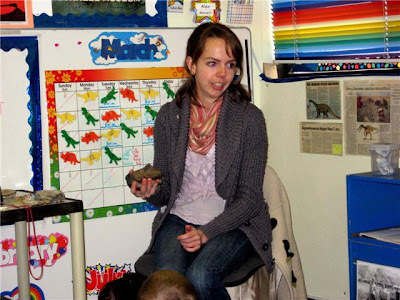 Hillary is a Ph.D. candidate at the University of Calgary and a long time field colleague helping to collect dinos in Alberta. When my friend Lisa Z. e-mailed me if I knew someone in town who could talk to her son's class, I immediately thought of Hillary. A great time was had by all! Thanks for the pix Lisa! A New Basal Sauropodomorph Dinosaur from the Lower Jurassic Navajo Sandstone of Southern Utah. 2010. J. J. W. Sertich & M. A. Loewen, PLoS ONE 5(3): e9789. 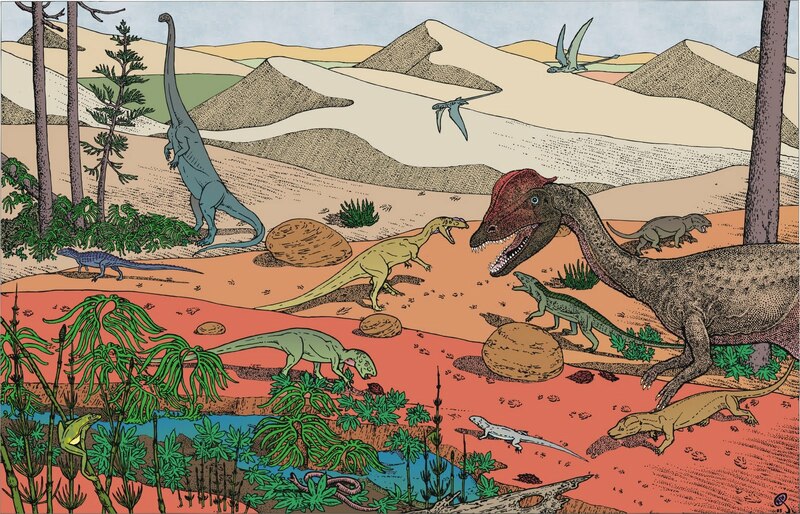 Utah’s red rocks have yielded a rare skeleton of a new species of sauropodomorph, Seitaad ruessi, that lived 185 million years ago and may have been buried alive by a collapsing sand dune. The discovery confirms the widespread success of sauropodomorph dinosaurs during the Early Jurassic Period. Seitaad ruessi (SAY-eet-AWD ROO-ess-EYE), is derived from the Navajo word, “Seit’aad,” a sand-desert monster from the Navajo (Diné) creation legend that swallowed its victims in sand dunes (the skeleton of Seitaad had been “swallowed” in a fossilized sand dune when it was discovered); and Ruess, after the artist, poet, naturalist and explorer Everett Ruess who mysteriously disappeared in the red rock country of southern Utah in 1934 at age 20. In life, Seitaad would have stood about about 1 m tall at the hips and was 3 to 4.5 m long. It would have weighed approximately 70 to 90 kg, and could walk on two or four legs. Like its later gigantic sauropod relatives, Seitaad most likely ate plants. Adam Sedgwich (March 22, 1785 - January 27, 1873) was an English geologist who first applied the name Cambrian to the geologic period of time, now dated at 570 to 505 million years ago. In 1818 he became Woodwardian Professor of Geology at Cambridge, holding a chair that had been endowed ninety years before by the natural historian John Woodward. A new dromaeosaurid (Dinosauria: Theropoda) from the Upper Cretaceous Wulansuhai Formation of Inner Mongolia, China. 2010. Xu Xing, et al. Zootaxa, March 19. Download the PDF. Linheraptor exquisitus was approximately eight feet long and 50 pounds, and would have been a fast, agile predator that preyed on protoceratopsians. Within the Dromaeosauridae family, Linheraptor is most closely related to another recently discovered species Tsaagan mangas. Tsaagan's skull indicates that it is more primitive than Velociraptor, and the skeleton of the new species should help reconstruct the series of evolutionary changes within the Dromaeosauridae. Laetoli Footprints Preserve Earliest Direct Evidence of Human-like Bipedal Biomechanics, 2010. PLoS; will be published on Monday, March 22. 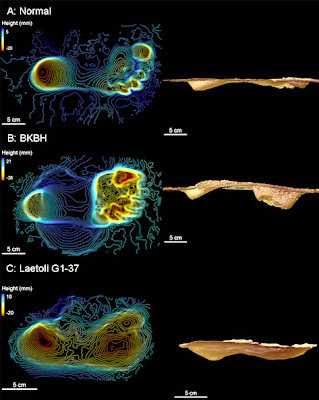 Three dimensional scans of experimental footprints and a Laetoli footprint, A, modern human footprint walking with a normal, extended limb, B, modern human footprint walking with a bent-knee, bent-hip gait, C, Laetoli. footprint. A trackway of fossil footprints preserved in volcanic ash deposited 3.6 million years ago was uncovered in Laetoli, Tanzania, more than 30 years ago. The significance of those prints for human evolution has been debated ever since. The only individuals that could have produced these footprints are Australopithecus afarensis, the only bipedal species alive in the area at that time. A. afarensis includes the famous fossil"Lucy," a cast of whose skeletal remains can be seen at the Cleveland Museum of Natural History. A number of features in the hips, legs, and back of this group indicate that they would have walked on two legs while on the ground. 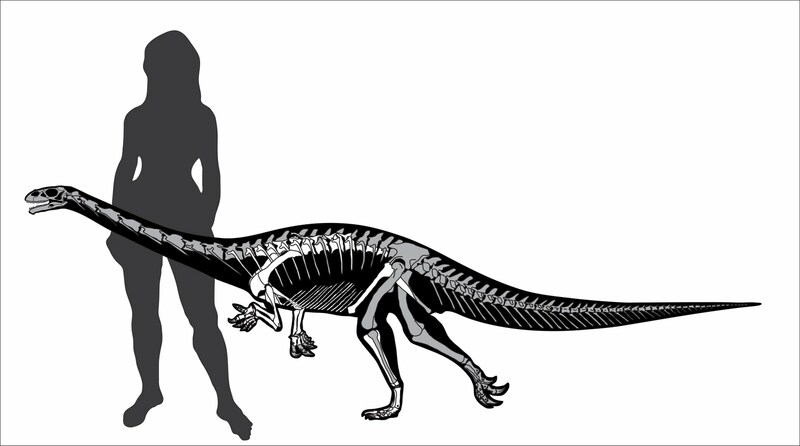 But the curved fingers and toes as well as an upward-oriented shoulder blade provide solid evidence that Lucy and other members of her species also would have spent significant time climbing in trees. 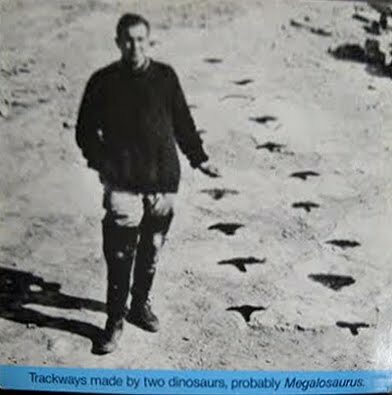 To resolve how the fossil trackways were made, scientists this built a sand trackway in filmed human subjects walking across the sand. The subjects walked both with normal, erect human gaits and then with crouched, chimpanzee-like gaits. Three-dimensional models of the footprints were collected and examined. It was found that the relative depth of footprints at the heel and toe, and found that depths are about equal when made by a person walking with an erect gait. In contrast, the toe print is much deeper than the heel print when produced by a crouched gait, a product of the timing of weight transfer over the length of the foot. An interesting "rock" initially tossed aside at a FedEx site near Pittsburgh International Airport turns out to be the skull of a meat-eating, early terrestrial amphibian that lived 70 million years before the first dinosaurs emerged, according to a paper released today in Annals of Carnegie Museum. 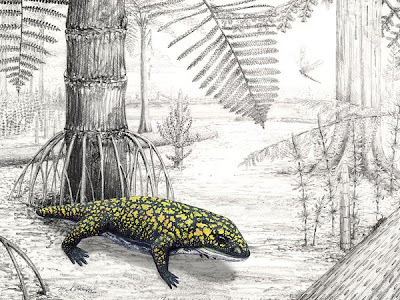 The approximately 300-million-year-old carnivorous amphibian has been named Fedexia striegeli, after the well-known shipping service and Adam Striegel, who spotted the animal's well-preserved, five-inch-long fossil skull while he was a University of Pittsburgh student on a field trip. Striegel originally threw it aside, thinking it wasn't important, but then he and class lecturer Charles Jones noticed pointy teeth and tusks, so the skull was brought to experts at the Carnegie Museum of Natural History. The asymmetry of the carpal joint and the evolution of wing folding in maniraptoran theropod dinosaurs. 2010. C. Sullivan, et al. Proc. Roy. Soc. B, published online before print March 3. Abstract :In extant birds, the hand is permanently abducted towards the ulna, and the wrist joint can bend extensively in this direction to fold the wing when not in use. Anatomically, this asymmetric mobility of the wrist results from the wedge-like shape of one carpal bone, the radiale, and from the well-developed convexity of the trochlea at the proximal end of the carpometacarpus. Among the theropod precursors of birds, a strongly convex trochlea is characteristic of Coelurosauria, a clade including the highly derived Maniraptora in addition to tyrannosaurs and compsognathids. The shape of the radiale can be quantified using a ‘radiale angle’ between the proximal and distal articular surfaces. The radiale angle progressively increased still further within Maniraptora, with concurrent elongation of the forelimb feathers and the forelimb itself. Carpal asymmetry would have permitted avian-like folding of the forelimb in order to protect the plumage, an early advantage of the flexible, asymmetric wrist inherited by birds. Fossil avian eggshell preserves ancient DNA. 2010. C.L. Oskam, et al. Proc. Roy. Soc. B, published online before print March 10. 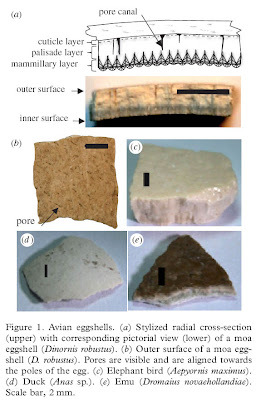 Abstract : Owing to exceptional biomolecule preservation, fossil avian eggshell has been used extensively in geochronology and palaeodietary studies. Here, we show, to our knowledge, for the first time that fossil eggshell is a previously unrecognized source of ancient DNA (aDNA). We describe the successful isolation and amplification of DNA from fossil eggshell up to 19 ka old. aDNA was successfully characterized from eggshell obtained from New Zealand (extinct moa and ducks), Madagascar (extinct elephant birds) and Australia (emu and owl). Our data demonstrate excellent preservation of the nucleic acids, evidenced by retrieval of both mitochondrial and nuclear DNA from many of the samples. Our quantitative PCR experiments also demonstrate that moa eggshell has approximately 125 times lower bacterial load than bone, making it a highly suitable substrate for high-throughput sequencing approaches. Importantly, the preservation of DNA in Pleistocene eggshell from Australia and Holocene deposits from Madagascar indicates that eggshell is an excellent substrate for the long-term preservation of DNA in warmer climates. S. R. Bissette’s Tyrant is © & ® S. R. Bissette. Steve has an always interesting blog over at his home page, that is worth a read. 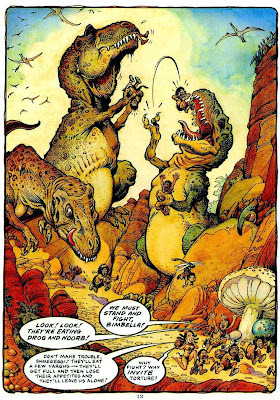 He also has a new web-comic, King of Monster Island (above). Image from HERE. Visit the Wall of Fame at TEGNESERIEMUSEET I DANMARK (The Denmark Comics Museum). The evolution of phototransduction from an ancestral cyclic nucleotide gated pathway. 2010. D.C. Plachetzki, et al.Proc. Roy. Soc. B, published online before print March 10. By studying the hydra, a member of an ancient group of sea creatures that is still flourishing, scientists have made a discovery in understanding the origins of human vision. 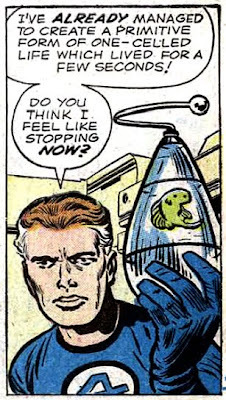 Hydra are simple animals that, along with jellyfish, belong to the phylum cnidaria. 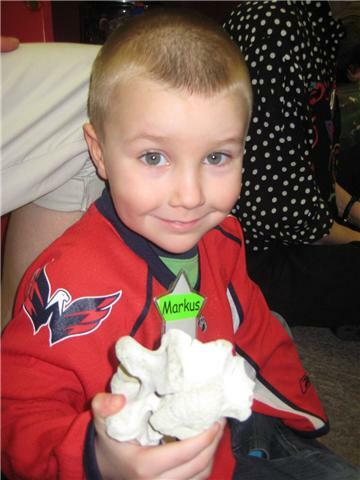 Cnidarians first emerged 600 million years ago. "We determined which genetic 'gateway,' or ion channel, in the hydra is involved in light sensitivity," said senior author Todd H. Oakley. "This is the same gateway that is used in human vision." 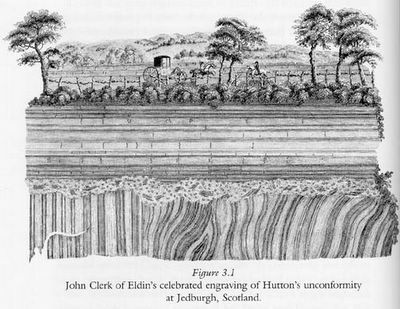 Lapworth (Sept. 30, 1842 - March 13, 1920) was an English geologist who proposed what came to be called the Ordovician period (505 to 438 million years old) of geologic strata. Lapworth is famous for his work with marine fossils called graptolites. By fastidiously collecting the tiny, colonial sea creatures, he figured out the original order of layered rocks that had been faulted and folded in England's Southern Uplands. This method of correlating rocks with graptolites became a model for similar research throughout the world. In 1879, Lapworth proposed a new classification of Lower Paleozoic rocks with the Ordovician, between the redefined Cambrian and Silurian periods. The name comes from an ancient Welsh tribe, the Ordovices. Intercalation as a means to suppress cyclization and promote polymerization of base-pairing oligonucleotides in a prebiotic world. 2010. E. D. Horowitz, et al. PNAS, Published online before print March 8. Scientists have discovered that small molecules could have acted as "molecular midwives" in helping the building blocks of life's genetic material form long chains and may have assisted in selecting the base pairs of the DNA double helix. "Our hypothesis is that before there were protein enzymes to make DNA and RNA, there were small molecules present on the pre-biotic Earth that helped make these polymers by promoting molecular self-assembly," said Nicholas V. Hud. "We've found that the molecule ethidium can assist short oligonucleotides in forming long polymers and can also select the structure of the base pairs that hold together two strands of DNA." English fossil collector who made her first significant discovery at the age of 11 or 12 (sources differ on the details), when she found a complete skeleton of an Ichthyosaurus, from the Jurassic period. The ten-meter (30 feet) long skeleton created a sensation and made her famous. 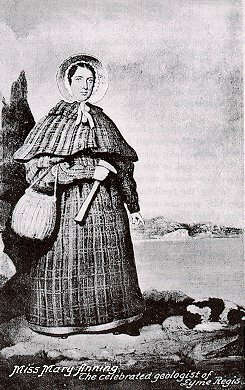 Anning's determination and keen scientific interest in fossils derived from her father's interest in fossil hunting, and a need for the income derived from them to support her family after his death in 1810. 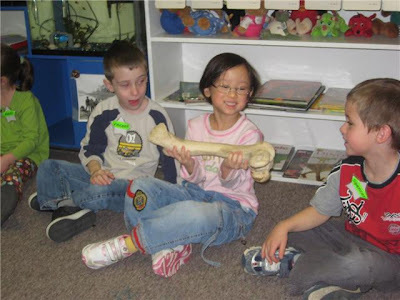 She sold large fossils to noted paleontologists of the day, and smaller ones to the tourist trade. In 1823, Anning made another great discovery, found the first complete Plesiosaurus. Later in her life, the Geological Society of London granted Anning an honorary membership. FYI, my schedule is not back to normal yet. Thanks for your patience! 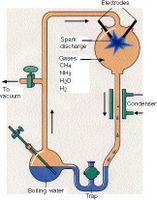 Miller is an American chemist who made a series of famous experiments beginning in 1953, to determine the possible origin of life from inorganic chemicals on the primeval earth. He passed electrical discharges (simulating thunderstorms) through mixtures of reducing gases, such as hydrogen, ammonia, methane and water, that were believed to have formed the earliest atmosphere. An analysis days later showed that the resulting chemicals included glycine and alanine, the simplest amino acids & the basic building blocks of proteins. Other compounds included urea, aldehydes and carboxylic acids. Thus, a "primeval soup" is the currently accepted most plausible explanation, though incomplete, of the origin of the complex organic molecules of life. On this day in 1954, director Jack Arnold let loose The Creature from his Devonian-aged Amazonian lagoon. The Creature was actually played by two different men in two different suits; Ricou Browning did the underwater work and Ben Chapman was the Gill Man on land. Browning went on to produce the successful Flipper TV show in the mid-60’s. Calibrating the Cryogenian. 2010. F. Macdonald, et al. Science 327: 1241 – 1243. Geologists have found evidence that sea ice extended to the equator 716.5 million years ago, bringing new precision to a "snowball Earth" event long suspected to have taken place around that time. The new findings -- based on an analysis of ancient tropical rocks that are now found in remote northwestern Canada -- bolster the theory that our planet has, at times in the past, been ice-covered at all latitudes. "This is the first time that the Sturtian glaciation has been shown to have occurred at tropical latitudes, providing direct evidence that this particular glaciation was a 'snowball Earth' event," says lead author Francis A. Macdonald. 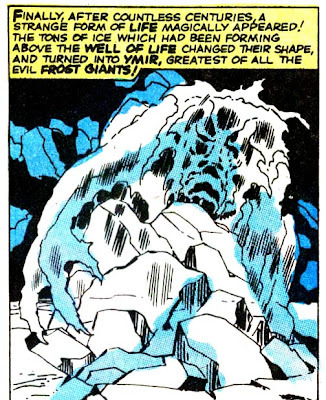 "Our data also suggests that the Sturtian glaciation lasted a minimum of 5 million years." The survival of eukaryotic life throughout this period indicates sunlight and surface water remained available somewhere on the surface of Earth. The earliest animals arose at roughly the same time, following a major proliferation of eukaryotes. Even in a snowball Earth, Macdonald says, there would be temperature gradients on Earth and it is likely that ice would be dynamic: flowing, thinning, and forming local patches of open water, providing refuge for life. The Chicxulub Asteroid Impact and Mass Extinction at the Cretaceous-Paleogene Boundary. 2010. P. Schulte, et al. Science 327: 1214 – 1218. Responding to challenges to the hypothesis that an asteroid impact caused a mass extinction on Earth 65 million years, a panel of 41 scientists re-analyzed data and provided new evidence, concluding that an impact in Mexico was indeed the cause of the mass extinction. Thirty years ago, Luis Alvarez, Jan Smit and their coworkers suggested a large meteorite slammed into Earth 65 million years ago and caused one of the most severe mass extinctions in Earth's history, ending the age of the dinosaurs. In 1991, a more than 200-kilometer-wide impact crater was discovered in Yucatan, Mexico, that coincided with the extinctions. Since then, the impact hypothesis has gained overwhelming acceptance within the scientific community. Still in recent years, a few scientists have challenged this hypothesis. To address their claims, a panel of 41 experts from Europe, the U.S., Mexico, Canada and Japan provide new data from the analysis of ocean drilling and continental sites and re-analyze the relevant literature in the field, including the most recent research. They find that alternative hypotheses are inadequate to explain the abrupt mass extinction and that the impact hypothesis has grown stronger than ever. The fossil record clearly shows a mass extinction event across the planet at about 65.5 million years ago. Because this change is so dramatic, geologists use it to define the end of the Cretaceous period and the start of the Paleogene period (formerly called the Tertiary period). They refer to the time of the extinctions as the K-Pg boundary. 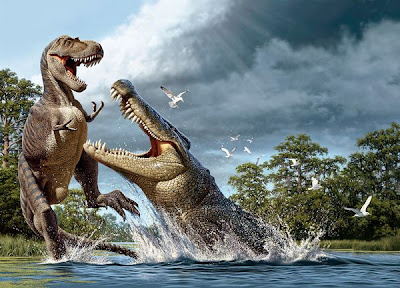 Some scientists have suggested that the Chicxulub ("chik-shoo-loob") impact in Mexico happened 300,000 years before the K-Pg boundary and therefore, came too early to have been the major cause of extinctions. They point to deposits at sites around the Gulf of Mexico with a layer of tiny glass-like blobs of melted impact material that, according to their interpretation, was deposited at about 300,000 years before the K-Pg boundary mass extinction. As an alternative, they suggest the Deccan Traps —unusually active volcanoes in what is now India—led to global cooling and acid rain, and were the major cause of mass extinction, not the Chicxulub impact in Mexico. However, the reviewers find that what appears to be a series of layers neatly laid down over 300,000 years near the impact site were actually violently churned and then dumped in a thick pile in a very short time. Models suggest the impact at Chicxulub was a million times more energetic than the largest nuclear bomb ever tested. An impact of this size would eject material at high velocity around the world, cause earthquakes of magnitude >10, continental shelf collapse, landslides, gravity flows, mass wasting and tsunamis and produce a relatively thick and complex sequence of deposits close to Chicxulub. •The asteroid was about 12 km wide. In the UK, the city of Bristol, the Isle of Wight and Jersey are all about that size. •The asteroid was about 10,000 times more massive than the total mass of the human world population. In other words, the asteroid was about 3x10^15 kilograms (or about 3x10^12 tonnes). •At impact, the asteroid is estimated to have been traveling at 20 km per second , roughly 20 times the speed of a rifle bullet. •The impact released about a billion times more energy than the atomic bombs dropped on Hiroshima and a million times larger than the largest nuclear bomb ever tested. •The initial impact crater was about 100 km wide and 30 km deep. •Impacts of this size on Earth are thought to happen on average about once every hundred million years. Wright (Dec. 21, 1889 – March 3, 1988) was an American geneticist who was one of the founders of modern theoretical population genetics. 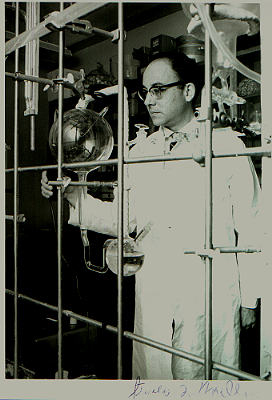 He researched the effects of inbreeding and crossbreeding with guinea pigs, and later on the effects of gene action on inherited characteristics. 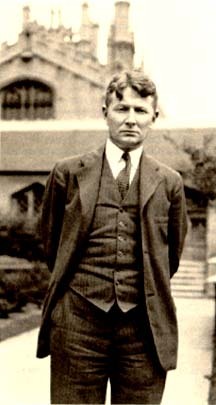 He adopted statistical techniques to develop evolutionary theory. Wright is best known for his concept of genetic drift, called the Sewell Wright effect - that when small populations of a species are isolated, out of pure chance the few individuals who carry certain relatively rare genes may fail to transmit them. The genes may therefore disappear and their loss may lead to the emergence of new species, although natural selection has played no part in the process. Check out genetic drift at The Biology Project at The University of Arizona. 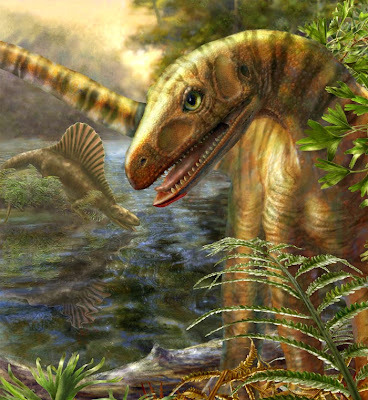 Dinosaurs Older Than Previously Thought? Ecologically distinct dinosaurian sister group shows early diversification of Ornithodira. 2010. S. Nesbitt, et al. Nature 464: 95-98. Asilisaurus kongwe. Image by M.H. Donnelly (Field Museum). Paleontologists announced the discovery of a dinosaur-like animal—one that shared many characteristics with dinosaurs but fell just outside of the dinosaur family tree—living 10 million years earlier than the oldest known dinosaurs. 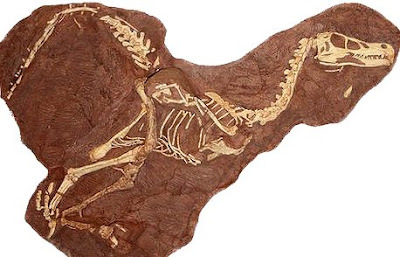 The researchers conclude that dinosaurs and other close relatives such as pterosaurs might have also lived much earlier than previously thought. At least 14 individuals of the new species Asilisaurus kongwe (a-SEE-lee-SOAR-us KONG-way) were recovered from a single bone bed in southern Tanzania. The individuals stood about 0.5 to 1 m tall at the hips and were 1 to 3 m long. They weighed about 10 to 30 kg. Asilisaurus walked on four legs and most likely ate plants or a combination of plants and meat. They lived about 240 million years ago. Asilisaurus is part of a sister group to dinosaurs known as silesaurs. Silesaurs are considered dinosaur-like because they share many dinosaur characteristics but still lack key characteristics all dinosaurs share. 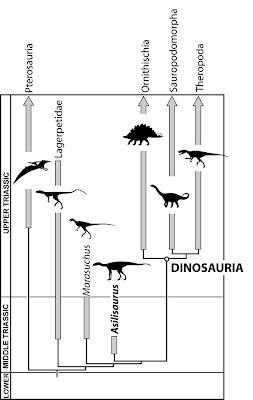 Even though the oldest dinosaurs discovered so far are only 230 million years old, the presence of their closest relatives 10 million years earlier implies that silesaurs and the dinosaur lineage had already diverged from common ancestors by 240 million years ago. Silesaurs continued to live side by side with early dinosaurs throughout much of the Triassic Period (between about 250 and 200 million years ago). 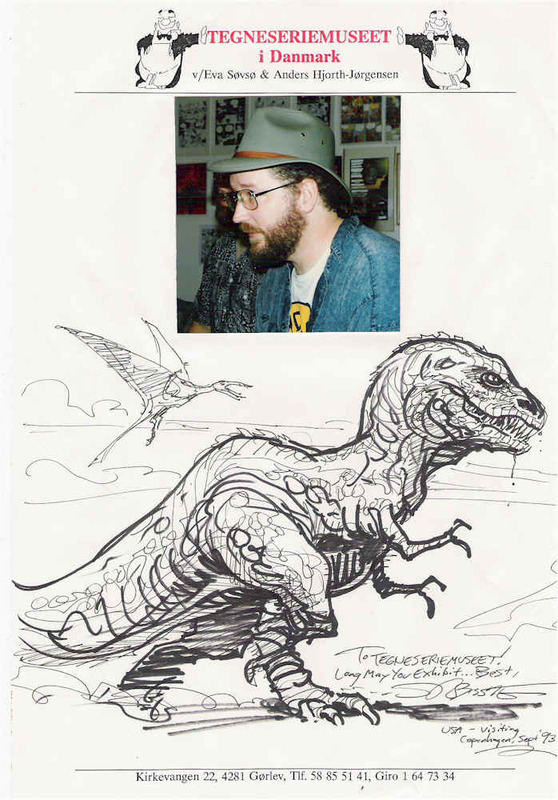 A tip of the fedora to the late, great Willis O'Brien who breathed life into the fur and armature that become King Kong, the 8th Wonder of the World! created King Kong. O'Brien was a sculptor and cartoonist for the San Francisco "Daily News" before he first dabbled in the medium of film during the 'teens. His work caught the attention of the Edison company, for whom he produced several short subjects with a prehistoric them. 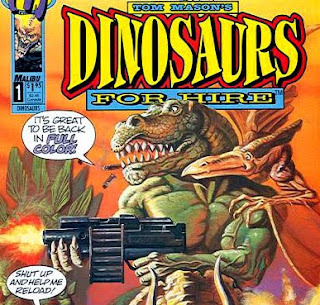 Titles include The Dinosaur and the Missing Link, RFD 10,000 B.C and Prehistoric Poultry. His method of animating small rubber figures, carefully molded over metal skeletons with movable joints, by moving them a fraction of an inch for each frame of film exposed, became the standard process of live-action animation. 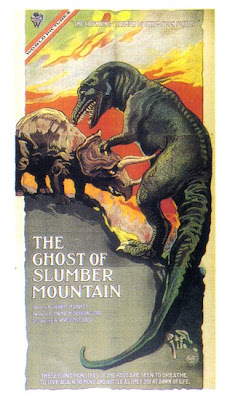 In 1918 he made his most ambitious film yet, The Ghost of Slumber Mountain paving the way for The Lost World (1925), a major Hollywood feature which told of a search for prehistoric creatures. O'Brien's dinosaurs were his most realistic yet, and still impress today, even in the wake of Jurassic Park Still, Obie (as he was known) kept experimenting. When producer Merian C. Cooper saw his work, he hired O'Brien to animate King Kong (which, up to that point, was to have been shot with an actor in a gorilla suit). 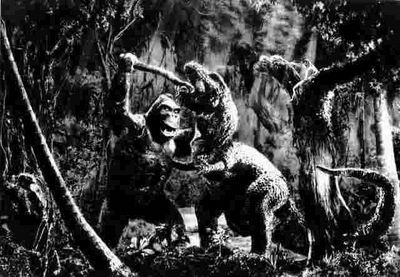 The extraordinary success of King Kong (1933) spawned an immediate sequel, The Son of Kong (also 1933), and made O'Brien a hero to several generations of fantasy filmmakers to come. 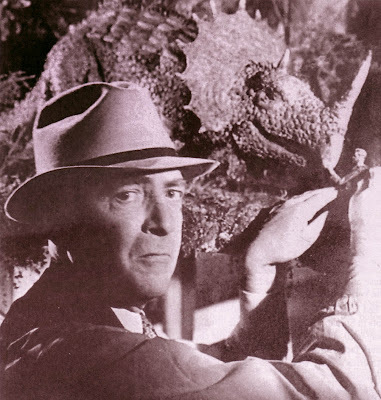 O'Brien won his only Oscar for his effects in Mighty Joe Young (1949), another giant-monkey movie, on which his protégé (and successor) Ray Harryhausen worked. 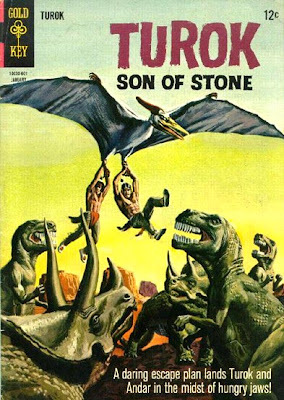 O'Brien worked on other giant-monster movies (including 1957's The Black Scorpion his last) before dying in 1962. Today, O'Brien would be kingpin of his own studio, but even in the wake of King Kong he had trouble launching other film projects, and many promising ideas languished on studio drawing boards for decades to follow. 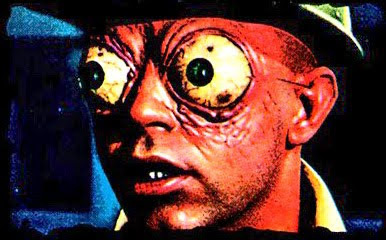 One of the RKO staff with whom he'd worked in the 1930s, Linwood Dunn, gave O'Brien his final employment, doing stop-motion figures for It's a Mad Mad Mad Mad World (1963). In 1950 O'Brien received (finally!) a special Oscar for his work on Mighty Joe Young which was the first such award ever given for special effects. This film also launched the career of the next great stop-motion animator, Ray Harryhausen. The snake Sanajeh indicus, n. gen. n. 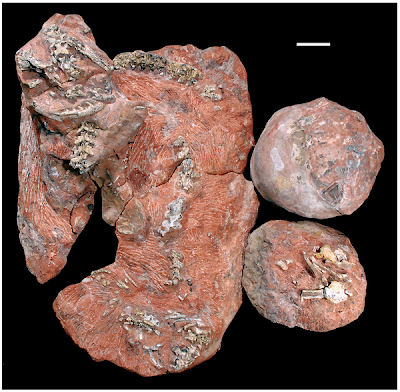 sp., in association with a partial clutch of three titanosaur eggs (oogenus Megaloolithus) and a titanosaur hatchling. The remains of a nearly complete snake Sanajeh indicus were found preserved in the nest of a sauropod dinosaur in 67-million-year-old sediments from Gujarat, western India. The snake was coiled around a recently hatched egg adjacent to a hatchling sauropod. Remains of other snake individuals associated with egg clutches at the same site indicate that the newly described snake made its living feeding on young dinosaurs. Working with the sediment-covered and inscrutable specimen in 1987, Mohabey recognized dinosaur eggshell and limb bones but was unable to fully interpret the specimen. In 2001, Wilson visited Mohabey at his office at the Geological Survey of India and was astonished when he examined the specimen. "I saw the characteristic vertebral locking mechanism of snakes alongside dinosaur eggshell and larger bones, and I knew it was an extraordinary specimen---but I also knew we needed to develop it further," Wilson said.